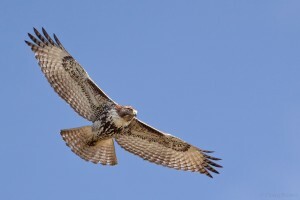 Raptor Breeding and Reproductive Success on the Upper Rio Grande Gorge /Hawks Aloft Inc. The Rio Grande Gorge is a dramatic landscape with an abundance of sheer cliff walls, fast running water and pristine wilderness that has long been a draw for nature lovers, but has seen increased traffic in recent years. 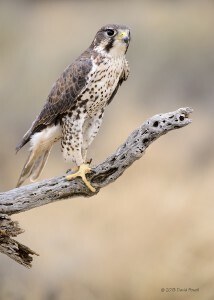 Breeding raptors are drawn to the area for the practicality of the site for nesting—the abundance of cliff walls provide ideal nest sites for many species including Ferruginous Hawks, Prairie Falcons, Peregrine Falcons, Red-tailed Hawks, and Golden Eagles. The adjacent high plains grass and shrublands host numerous small mammals and birds providing an adequate prey base for the predatory raptors. Since 2000, Hawks Aloft has conducted numerous surveys in the area to determine if increased human traffic has impacted the success of raptors nesting in the area. As Northern New Mexico and lower Colorado become more heavily utilized for boating, fishing, hiking, and cycling. The Bureau of Land Management that oversees these public lands, must manage for multiple uses while still protecting critical wildlife. These studies were conducted to help guide management decisions that may impact breeding raptors. Intensive monitoring schedules were maintained throughout the breeding season—particularly during incubation and early nestling stages when nest abandonment can be common—in order to accurately gauge the success of numerous nests in relation to human activity in the surrounding area, weather, and prey populations.